If you have looked through my gallery, then you have noticed mini-theme of grooms and their rings. It is always a joy to see grooms on their wedding day grow accustomed to their newest piece of jewelry. The bride has obviously grown accustomed to having a ring on her hand because of the months of wearing an engagement ring. However, it seems that without fail, within minutes of being announced husband and wife, every groom I photograph plays with his ring. It’s foreign and new and seems to demand attention. Here, Bryan fiddles with his wedding band at the back of the church as he waits for the guests to leave before formal photographs. What I like about this image is that it also serves as a detail shot. 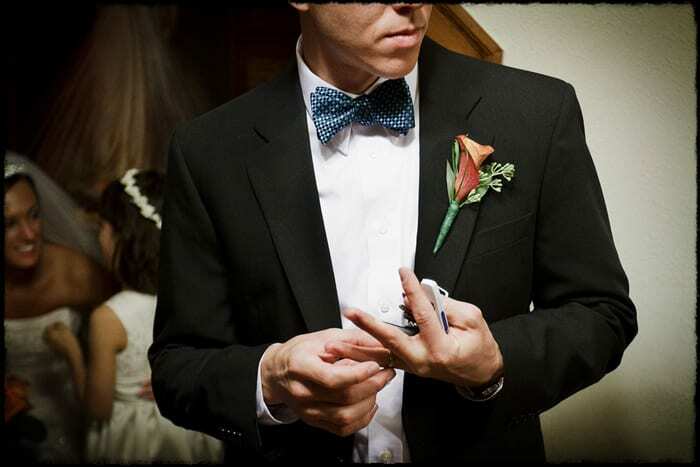 This photograph captures Bryan’s bow tie, his corsage, and his bride and flower girl talking in the background.